From a design perspective, generating HD content from projected light can be tough. It’s considerably more difficult than generating high resolution content on smartphones or televisions. With your phone, increased resolution is simply a matter of cramming more pixels into a smaller space. It’s not a totally trivial task, but it is when compared to the engineering required to do the same with projected light. Which is why if you want to buy a projector with a native 4K resolution, the cheapest reliable options on the market start around $5,000. That relatively low price is possibly with breakthrough technology like Sony’s SXRD. Fortunately, for people who aren’t ready to spend five-grand on a projector, there are some effective was to closely mimic 4K. These 4K equivalent effects allow you to slice the price of a 4K projector to half or less. The Epson Home Cinema 4010 4K Projector is an example of faux 4K in action. It technically delivers 4K resolution, but like any projector that costs under $5,000 or so, the resolution is really the result of some sly engineering tricks. 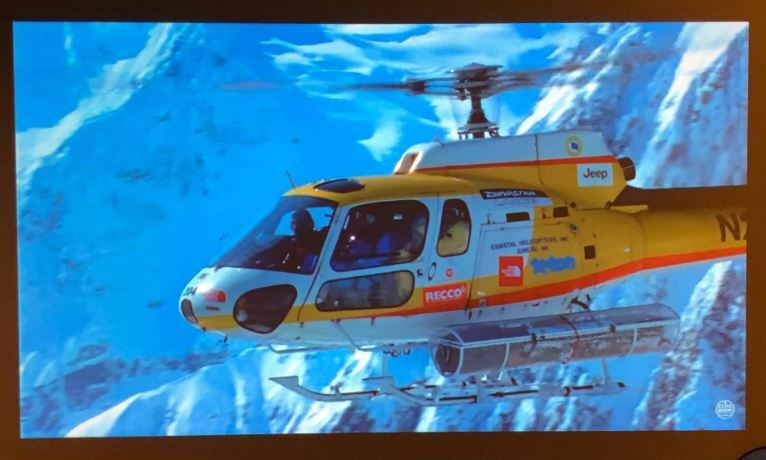 It’s not a pixel-perfect recreation of 4K. But even the most snobbish videophile will be inclined to agree the Epson Home Cinema Projector and its recreation of 4K is experientially indistinguishable from its true-to-life counterpart. Resolution aside, the Epson Home Cinema 4010 4K PRO-UHD 3-Chip Projector is made to deliver an immersive cinematic experience on a large screen. The chassis of the Epson Home Cinema 4010 3-Chip Projector measures 17.7 x 20.5 x 6.7-inches. It’s a full-sized body, weighing just shy of 25 pounds. 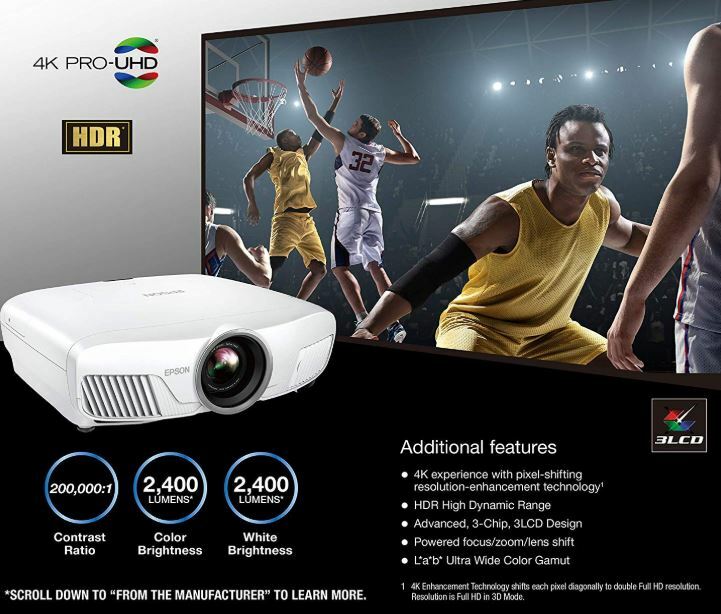 With the proportions of a powerhouse, the 4K PRO-UHD 3-Chip Projector can be operated as a front, rear, or ceiling mount device. With respect to style, the Epson 4010 4K Projector’s chassis isn’t trying to impress anyone. It’s professional-looking, if a bit bland. The white casing is slightly highlighted by the placement of front-facing heat vents. Beyond that, only two LEDs can be seen on its face, giving you a better insight into the condition of the bulb and temperature. 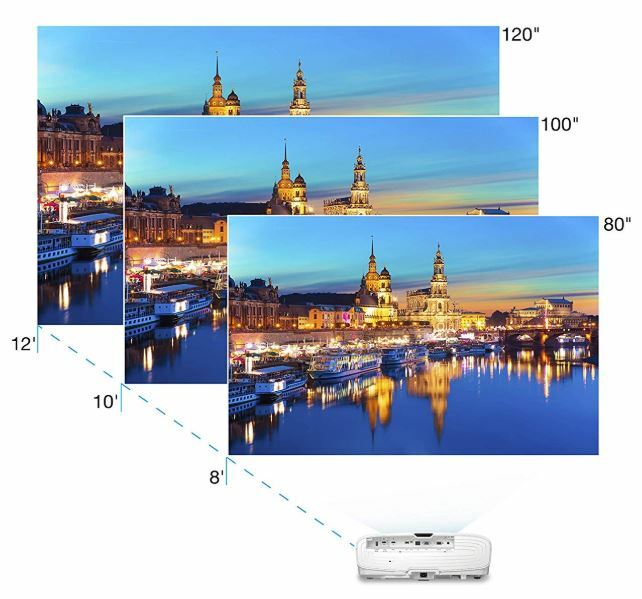 The Epson Home Cinema 4010 4K projector may impress you with its screen sizes alone. Its minimum projection size is a massive 50” diameter, with a maximum setting of 300”. That works out to about 25-feet of vivid 4K content. And the wide throw ratio of 1.35-2.84. makes finding the right placement for the Epson Home Cinema 4010 4K Projector that much easier. Internally, a 3-axis motor helps provide 2.1x zoom, as well as a ± 96% horizontal and up to ± 47% vertical lens shift. And the manual adjustment keystone correction can be used for ±30 degrees of motion. Those versatile figures translate into an admirable range of focus control, and an especially wide range of lens adjustment. That’s essential for a projector like the Epson Home Cinema 4010 as it’s intended to be able to move from front projection to ceiling projection, and end up with excellent picture quality in each case. Although there’s no ultrawide aspect ratios supported, the Epson 4010 Projector does support standard 16:9 aspect resolution. It’s compatible with 4:3 and 16:10 as well. As mentioned above, the Epson Home Cinema 4010 uses engineering tricks to reach the visual perception of 4K resolution. It does this while technically not creating a pixel-perfect recreation of 4K. Carefully reading the description for the Epson Home Cinema 4010 4K Projector, you may notice its native resolution is actually 1920 x 1080 x 2. How does that work? Instead of using a traditional DLP construction for their projector, Epson made something rather novel. 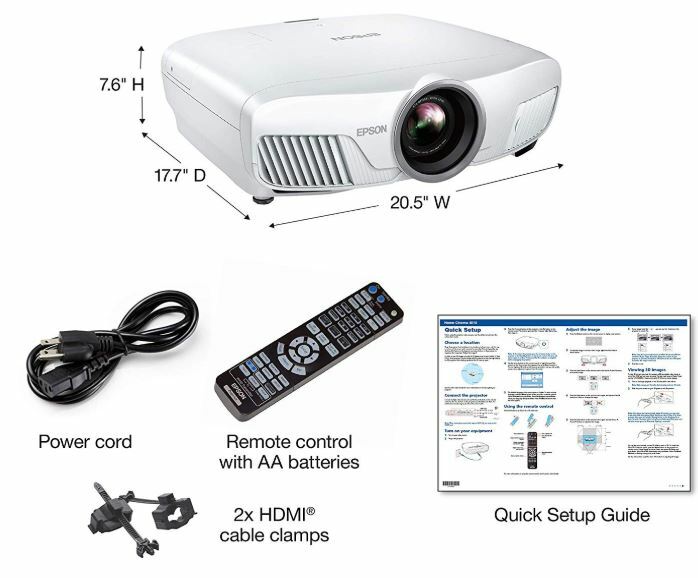 The 4010 4K PRO-UHD 3-Chip Projector works with three separate LEDs operating in conjunction with each other. These separate LEDs are then conjoined with a technique called pixel shifting, to group those three overlaying 1080p shots as micro-displays. In other words, it’s like the projector is actually gluing together 1080p components together to help create a larger resolution. Visually speaking, it works. A pixel-perfect 4K resolution for a 50” panel calculates to a total of roughly 88-pixels per inch. Adjusted to 50”, these overlapping LEDs work out to roughly 88-pixels per inch. Unless you’re an A/V expert, it’s actually quite difficult to tell these two effects apart. More importantly, you generally can’t do it within normal watching circumstances. If a trained eye wants to stand 10-inches from the wall and stare intently, differences can be found. And those difference can be somewhat more pronounced when you’re reaching out towards screen sizes well past 200”. DLP projection is infamous for its rainbow trail effect. Luckily, the Epson Home Cinema 4010 Projector uses a 3-chip design, crafted specifically to help prevent rainbows from cropping up. Epson’s lens was also made to allow for virtually zero hotspots or chromatic aberrations. And12-bit processing chip helps manage color with frame interpolation with the help of Epson’s proprietary motion control system. Some people are more vulnerable to the so-called rainbow effect than others. General audiences will likely agree that the Epson Home Cinema 4010 has virtually zero remnants of this issue. But again, a trained eye may be able to take pains to find the remnants of an issue. It really depends if you’re someone who’s more prone to seeing the effect. Apart from fighting away rainbow discoloration, the 3-chip design helps contribute to support for HDR. 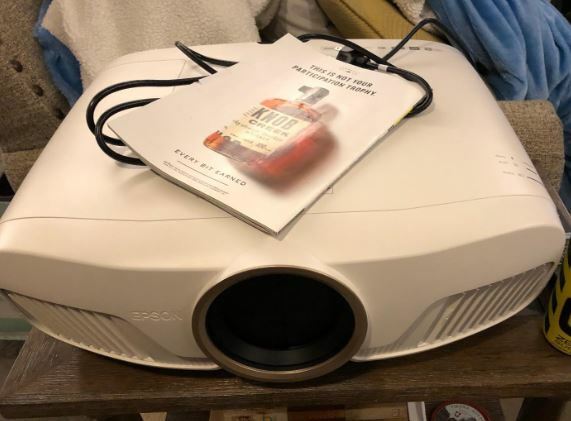 Perhaps most impressive of all, the Epson Home Cinema 4010 Projector delivers a DCI-P3 color gamut which is about 50% wider than Rec 709: the standardized television color spectrum. It’s got greater color vivacity than you can get from devices that don’t exceed the spectrum. In short, it’s a pleasure on the eyes. Deep contrast ratios are critical for true home theatre experiences, and that heightened range of colors contributes to a 200,000:1 contrast ratio. Stark contrasts are what makes a scene come alive, and what brings a projector as close as possible to delivering a true theater experience. With respect to its bulbs, the Epson Home Cinema 4010 projector delivers greatly balanced brightness. Measuring a maximum 2,400 lumen output for both color and white brightness, this projector is nothing if not bright. You’re not going to get the best picture possible in a well-lit room. But a 2,400 lumens output does help give you some wiggle-room with respect to ambient lighting. That heightened luminosity is the result of a 250W UHE lamp. It burns rather hot, resulting in a lifespan of about 5,000 hours while in ECO mode. Those lifespan figures drop towards 4,000 hours for medium-mode. And they lower to 3,500 hours with the highest performance. Compared to many other projectors, those figures are fairly low. Many projectors can provide 30,000 hours or more. But it’s important to keep these differences in context. 3,500 hours works out to about 2,300 full length movies. That’s one movie every night for more than six years. One thing to keep in mind is LED bulbs do tend to gradually lose luminosity over the course of their lifespan. Much of that time is baked in to these estimates. So even though your bulb may actually reach 9,000 hours, you’re probably going to want to change it along these suggested intervals. As any home theater quality protector should, the Epson Home Cinema 4010 4K PRO includes its own IR remote control. And it’s a full-fledged remote, consisting of more than two dozen buttons. The top row gives you control over power and source inputs, while the following row provides media controls. Just below that, you may notice the volume buttons are slightly larger than the other buttons a nice touch. Rounding out the remote, below the volume buttons, a set of controls to help you focus, zoom, or shift the lens. Lastly, there’s a set of navigational arrows surrounding an input button, and a few final menu buttons. Along the backside of the Epson Home Cinema 4010 4K PRO-UHD 3-Chip Projector, connections are made with the help of an optical HDMI port, or two HDMI ports. There is also a USB port, a micro-USB port for firmware updates, a LAN port for Internet connectivity, and a VGA port to connect to standard monitor. At the base of the projector is its power port, a standard 3-prong design familiar to desktop monitors and desktop computer cables. There are two things you won’t find inside this projector. The first is HDR10+, and the second is Dolby Vision. 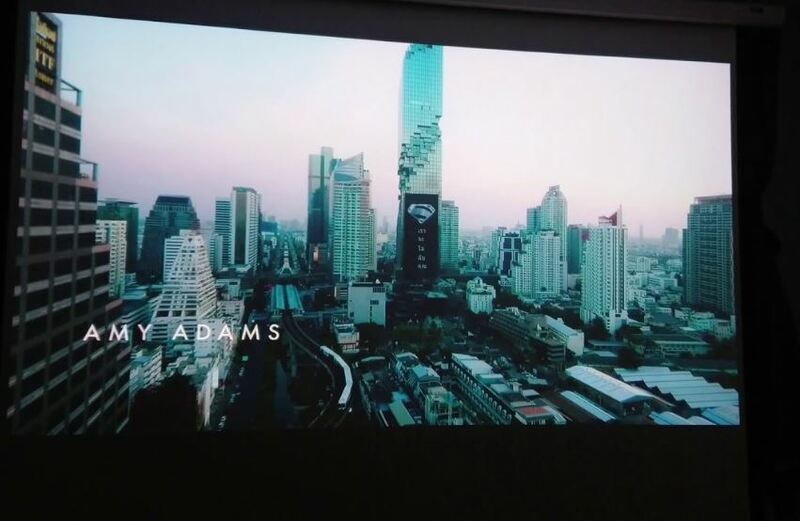 HDR10+ is not currently available on any projector, and support for Dolby Vision is rather thin as well. Some things you will find include a powered, slide-based lens cover, and 3D compatibility. Though you’ll need your own 3D glasses. Additionally, the 4010 PRO-UHD 3-Chip Projector can be secured with a Kensington Security Lock Port. Kensington locking equipment is fairly ubiquitous and secure for office or home environments. This kit includes the 4010 4K Projector, a power cord, two HDMI cable clamps, the remote control, AA batteries for the remote, and a quick start guide. Epson also includes a 2-year warranty, though it excludes damage from continual use or other forms of misuse. Who Should Choose the Epson Home Cinema 4010 4K PRO-UHD Projector? When you’re looking to setup a home theater, you want high resolution content, you want HDR content, and you want great sound. The Epson Home Cinema 4010 can deliver on two of the three. It’s a projector made for image quality above all else. They haven’t gone out of their way to pack storage space inside its chassis. It’s not loaded with native support for a bunch of streaming services you may or may not use. Epson even decided against using a default pair of speakers, instead leaving viewers to choose a sound solution worthy of being used with this projector. Dynamic color output, adaptable to almost any visual circumstance, is critical to creating a home theatre experience. Epson has taken pains to ensure brightness and color are fantastic out of the box. And that’s what makes the Epson Home Cinema 4010 4K PRO-UHD Projector worth a close look for anyone seeking a cost effective solution to the problem of 4K projection.